I bought a Honda Rebel 250 for my first bike. I learned how to ride on this bike and took the MSF course on a similar bike. After a few months, I realized I wanted a bigger smoother riding bike for longer distances. I researched and found the Shadow Spirit was built for comfort, which is what I was looking for in long rides. It also looks great, I have always loved cruisers and knew once I bought a bike it would be a cruiser. I would like to own a Harley at some point, but I think I will always keep a Shadow as well. I jumped from a Rebel 250 to a VTX1300 (both Hondas). I had no problem. I am 5'5" and 59 years old. I have put about 7,000 miles on my VTX in one year. I put about 4,000 miles on the Rebel the year before. The VTX is 650 pounds. I just have to be very careful where I park so I don't have to back her up hill. She is wonderful for the freeway and long distances. I do miss the Rebel for agility and just plain fun. The Rebel does great around town, just not that great on the freeways. The Rebel will let you get on the freeway for a while. Some riders say they have even riden long distances on the Rebel. However, the way cars are, and they don't go the speed limit, the bigger bikes are better at freeways. The Rebel got up to 80MPG and for a student that is great. The VTX gets about 51 MPG on long rides. I have a 1988 VT1100 Shadow, the first year Honda tweaked the design after they bought up the patents from HD-AMF. That's why they sometimes call it the HondaHarley because they wanted it to look like a softail. That's not why I bought it. I bought it because it's twice the bike and half the money. And she's completely American Made. Yep. I had a 250 and 450 Rebel. Both ended up being way too small. Trucks could run up on me with a 650. 1100's are the way to go. You want the power and trust me, you can handle the weight. The important thing is finding the body style that fits you. HD is working on catching up with the dependability and quality of other makers, but will always be way overpriced, as well as their service, accessories and parts. Very nice ride and you can't beat the comfort. I thought I might want a HD but after spending a week riding one, I really like the Yama and Honda cruisers better. 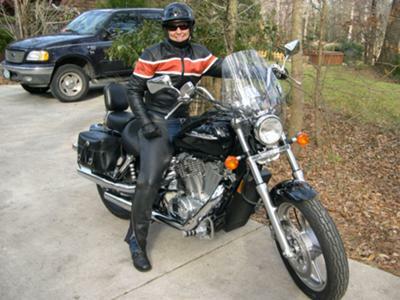 My 1100 VStar is perfect and I loved the summer I had use of a 750 Honda Aero. Please look at the Harley's again they are priced along with the bikes that are of the same quality. Nice new HD's beginning around 10k and up. I have had all different makes of bikes. But I am partial to the AMERICAN made brands. your crackin' me up! I have always wanted an HD and have recently resorted to the same questions myself, well price wise I had no choice, HD's are way pricier so I chose the Spirit and also for the comfort ride. I plan and sure hope to own a HD someday to fulfill that dream, but I will have to make much more money than I am right now!!! Honestly, if you were comfortable with the 750 then I would stick with it. I have struggled a bit with the big jump, and have dropped it a few times in parking lots. Nothing major but just kills the pride and does cost when you break or scratch nice shiny things on your bike! I ended up getting a engine guard, because I must have a problem with balancing the weight of it when walking it around to park it. I wouldn't suggest that big of a jump to anyone, however, it is working out so far other than the scratches and broken foot peg! As far as bigger being better, that was my reason, it is much heavier and is built for cruzin' on the highway. I have heard the 750 is great on the highway as well, so that is what I would go with if I were you. Just my .02 Have fun and Ride on! What it easy to go from a 250 to an 1100? I have a Rebel right now & would like something bigger, but am unsure of how big to go. (My first bike was a 750 that was quite comfortable & great on long distance rides so I thought about going up to that size again).